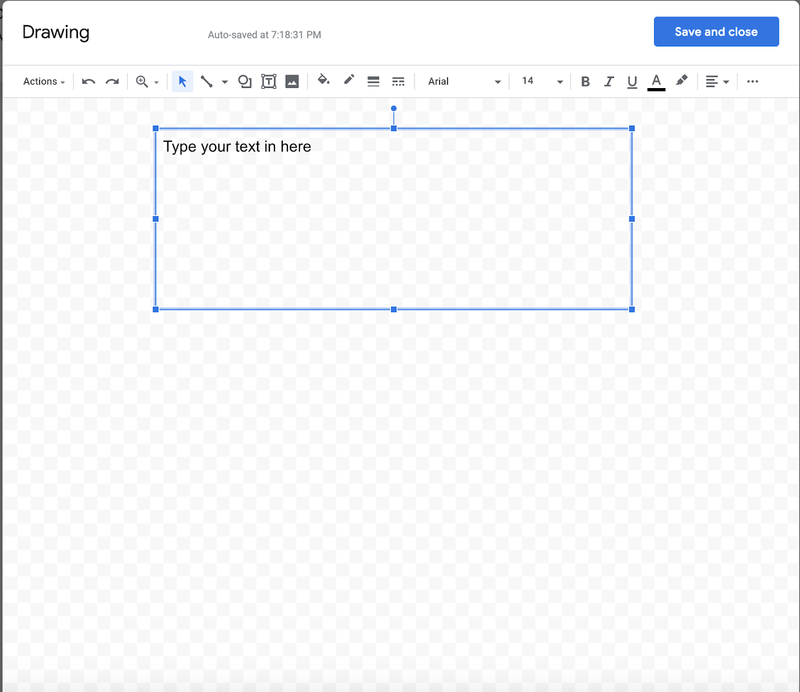 So you want to insert a textbox in Google Docs? A simple request, it might seem, as other word processors provide this feature pretty obviously. This is not so for Google Docs. 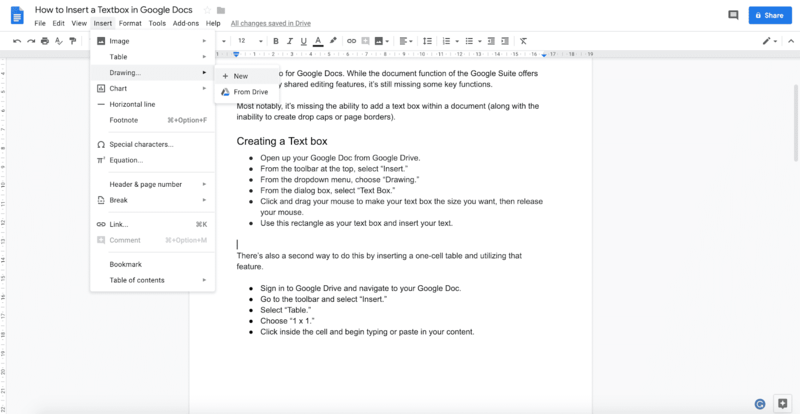 While the document function of the Google Suite offers revolutionary shared editing features, it’s still missing some key functions. Most notably, it’s missing the ability to add a textbox within a document (along with the inability to create drop caps or page borders). Fortunately, there are a few ways to work around this oversight. Type in the text you want in the textbox and choose if you want your text aligned to the left, center, or right. 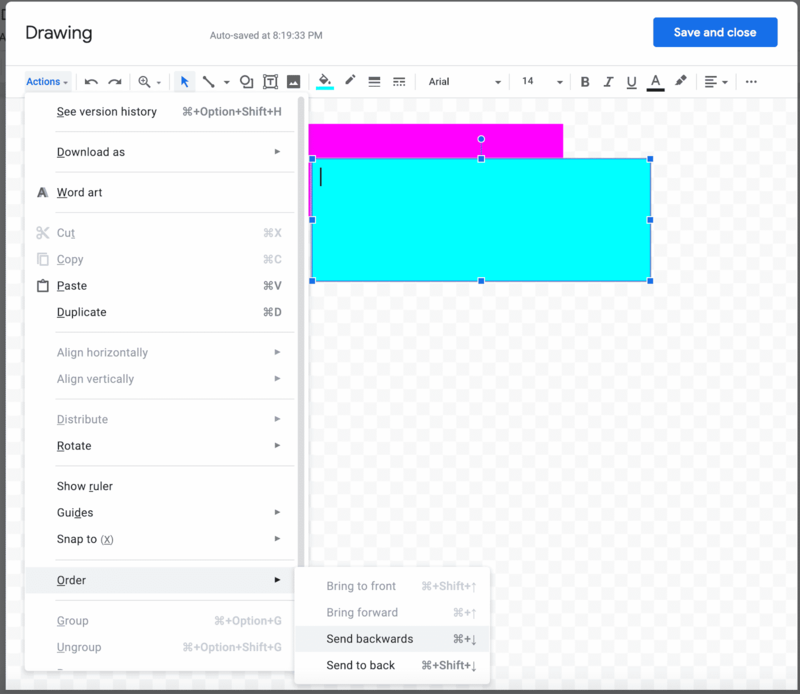 Adjust the size of the textbox to your desired dimensions. Click and drag your mouse to make your textbox the size you want within the document, then release your mouse. Use this rectangle as your textbox and insert your text. 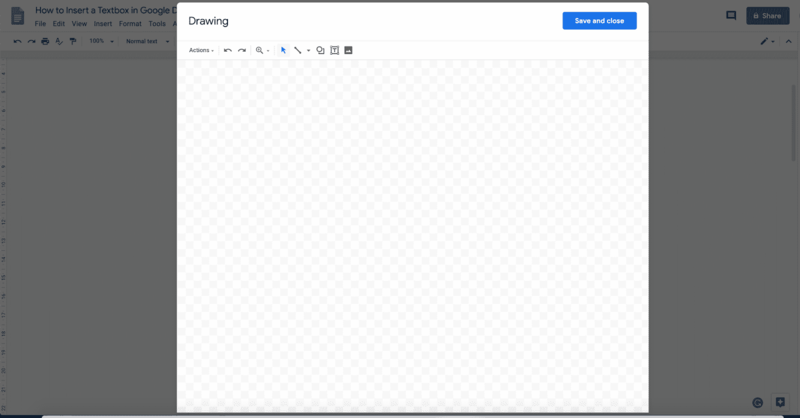 From the toolbar at the top of your Google Doc, select “Insert.” From the dropdown menu, choose “Drawing,” then “New,” as you can see below. From the dialog box, select “textbox,” which it the “T” icon in a box highlighted in blue below. Once you click that icon, pick a starting point, and drag your mouse diagonally, a textbox will appear in the checkered area. Type in the text you want in the textbox and choose if you want your text aligned to the left, center, or right. 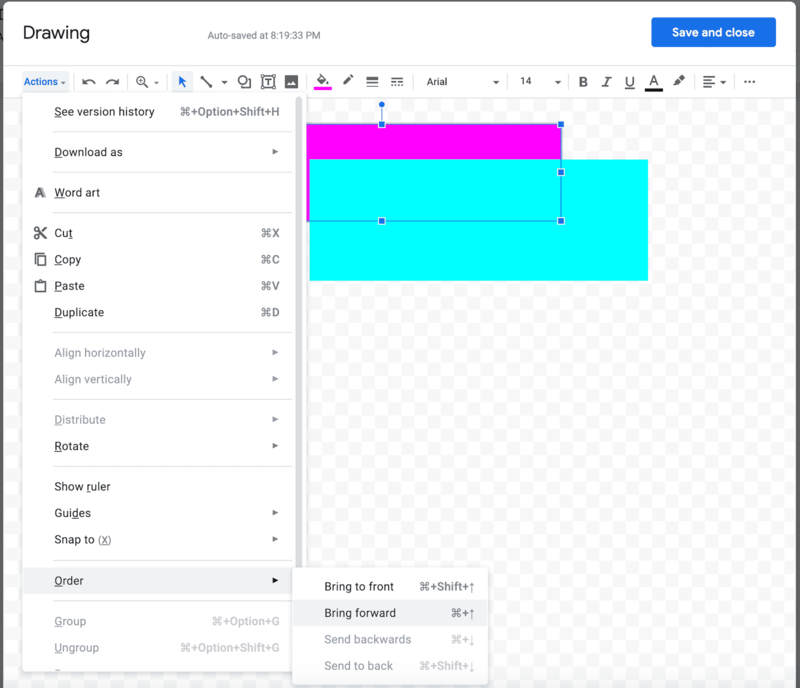 Adjust the size of the textbox to your desired dimensions by grabbing one of the little blue boxes in the corners and dragging it either inward toward the center of the box or outward, away from the center of the box. Press “Save and close.” You will be taken back to the document and a box with your text should now be located there. Click and drag your mouse to make your textbox the size you want within the document, then release your mouse. Use this rectangle as your textbox and insert your text. There’s also a second way to do this by inserting a one-cell table and utilizing that feature. Step 1: Sign in to Google Drive and navigate to your Google Doc. Step 5: Click inside the cell and begin typing or paste in your content. Steps 2-4 together look something like this. Click inside the box and begin typing. Format as needed. Voila! You have a textbox. If “format as needed” was a bit too loose of an order for you, here are some tips for altering your textbox once it’s in your document. Step one: Return to the drawing tool by double-clicking on the textbox. Select the textbox you want to modify. Step two: Select a formatting command and apply it to the textbox. The formatting command toolbar looks like this. Step three: Hit “Save and close.” Your textbox should now be formatted. Select your textbox and choose the “Fill Color” option highlighted in the toolbar (the little tipping paint can). From the drop-down menu, select the color you want for your textbox background and if you want it solid or gradient. In this example, we’ll use aqua. Your text background should now be filled with your chosen color, as you can see below. From there, just hit save and close and your textbox within the document should be modified. 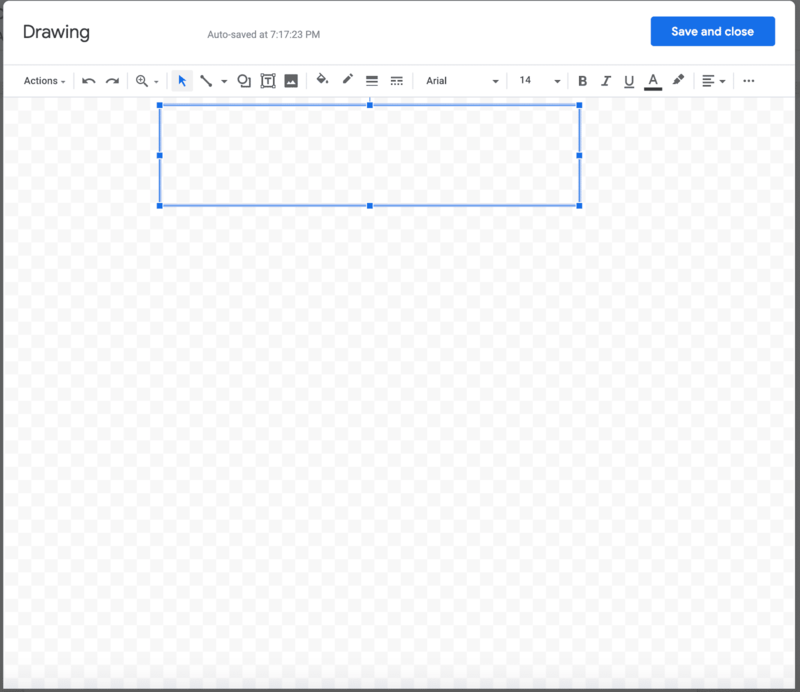 Step one: Go to the Google Drawing Dialog box. Step two: Select the textbox you want to move forward or backward. Step three: Select “Actions” in the upper left-hand corner. Step four: Select “Order” from the drop-down menu. Step five: Select “Bring forward” or “Send backward,” depending on what action you want to perform. Step six: Double check to make sure the action was completed correctly. Here are images of the steps above, so you can see how this looks. Afterward, it should look like this. Hit “Save and close” to deposit this textbox into your Google Doc. Resizing: Click the corner of the textbox and drag diagonally upward or downward to adjust the size. Relocating your textbox: Click inside your textbox and drag the box to the desired location. 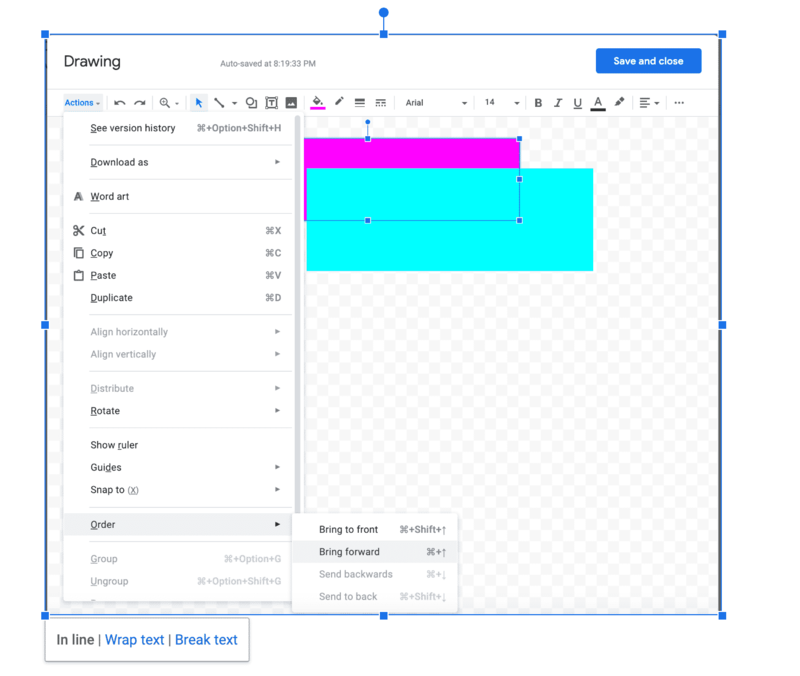 For making lines thinner or thicker: Select the textbox and then “Line Weight” to increase or decrease the thickness (thickness increases as the numbers increase). Wrapping text and adding line breaks: Select the textbox, then choose “Wrap Text” or “In Line.” If you want to insert a break, select “Break text.” You can see these three selections located all the way at the bottom of the image below. You can change the color, font, and size of text by selecting the “More” option and changing within that dialog box. 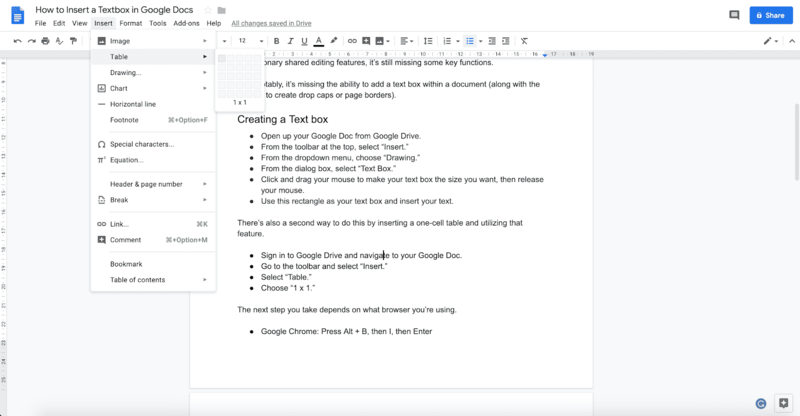 If you used the single-cell method, use the toolbar at the top of the Google Doc to edit. See the image below for reference. To edit words, double click the textbox, which will re-open the Google Drawings dialog box and allow you to change your content. If you used the single-cell method, just click within the cell and start typing. 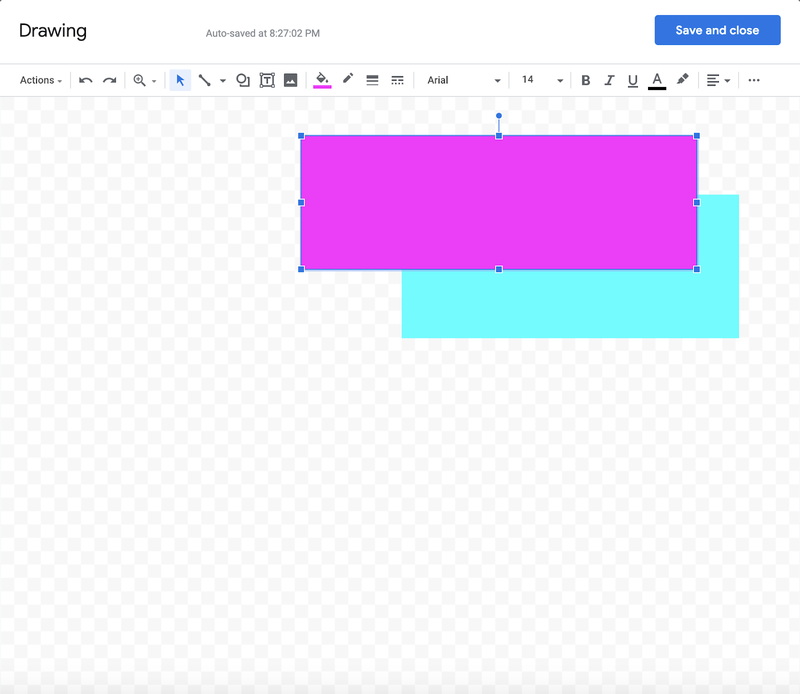 Once you’ve mastered the above, creating textboxes in Google Docs should be a cinch. You can walk around with the confidence of Beyonce knowing that you, too, are Google Docs ***flawless. 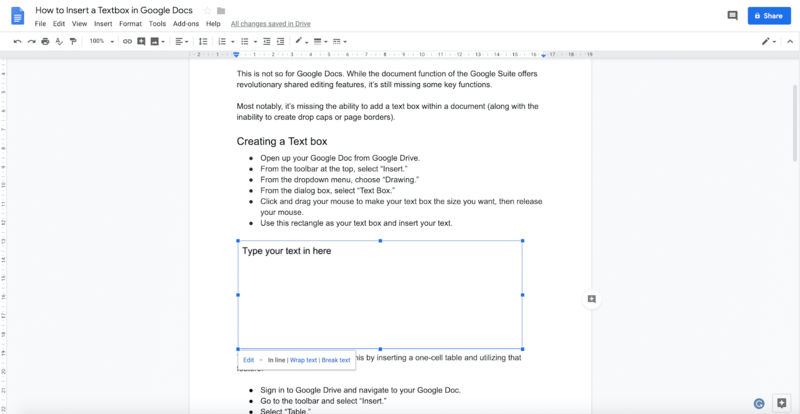 If you want to further master Google Docs for blogging read this guide. I saved 2 hours uploading this post from Google Docs to WordPress using Wordable. Try it yourself here.